March and the onset of Spring, and about time too after the relatively cold grey weather we've endured these last few weeks. Officially the winter has been about average but here in SE England and East Anglia it really has been quite miserable. The coming of March saw brighter weather over the first weekend and warmer weather at the beginning of the following week. Winter returned with a vengeance on March 23rd, even the Bluebell Railway's gala opening of the East Grinstead extension wasn't spared the snow although conditions elsewhere were very much worse. The final week of the month features the new East Grinstead extension of the Bluebell Railway, including the first through train from Victoria on the 28th, headed by GBRf 66739 which was named Bluebell Railway in a ceremony at Horsted Keynes. As I work in East Grinstead these days I expect it may feature more in my pictures over the coming months. My first domestic pictures in April were taken on the 10th & 11th in London and South Wales, in somewhat contrasting weather conditions. April 20th brought the first proper spring day, wall to wall sunshine so I took myself around London for the day. The following week was progressively warm and sunny, although my opportunities to take advantage were a bit limited. 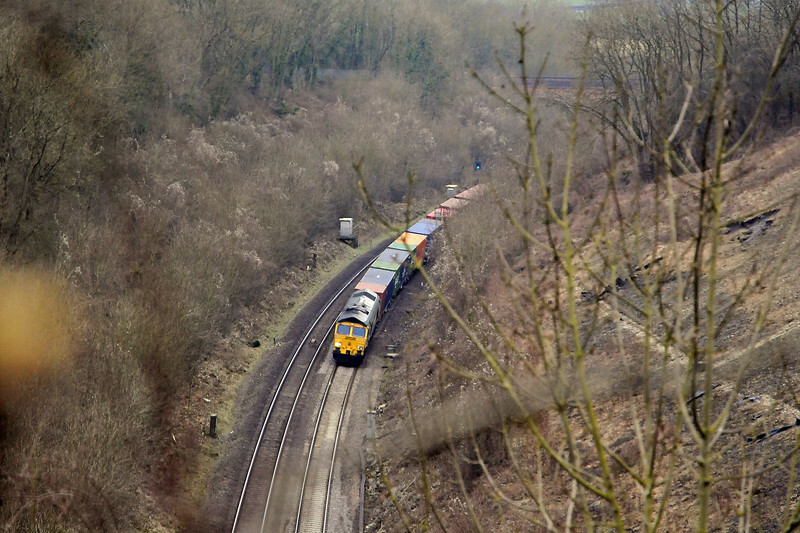 On Monday 29th, Tuesday 30th and Wednesday 1st I managed pictures of the 1M16 Caledonian Sleeper on the ECML, the Dollands Moor to Dagenham Channel Tunnel Express and its return in the evening and sundry MU shots on London Overground, crossing the Thames and at Norwood Junction. On Thursday 2nd I spent a very enjoyable couple of hours in the evening on London Overground's rebuilt East London Line, between Dalston and Surrey Quays. Our May Day bank holiday weekend was spent, as it always is with a number of old friends and their children, this time in a farmhouse overlooking the River Wye near Symonds Yat. I had a few opportunities for some pictures. The following week was generally disappointing weatherwise, although I did get a picture of the 7L23 in the early morning sunshine at Crouch Hill on my way to work on Tuesday and on Saturday spent an enjoyable afternoon, alternately getting soaked and baked (well sort of) in the fens around March. Week commencing 13th began with a picture of the 7L23 at Junction Road and continued with a range of early evening trains around North and North West London. On Saturday we went to Porthmadog in North Wales for the Welsh Highland Rail Ale Festival, catching the 06:23 from Euston, changing at Birmingham International into the 08:08 to Aberystwyth and Pwllheli. The weather forecast as late as Friday afternoon was not promising, but the reality was very much better, especially on Sunday. The weather went downhill the following week, nevertheless I managed some pictures on my way to and from work, mainly on the West and North London Line. Saturday did dawn fine and dry, I spent the day on my bike cycling from Willesden to Putney via Kew East in search of the Kew East diverts, which was fun. Saturday and the weather forecast for the Midlands was quite promising so I headed up the M40. At Harbury the 4O27 Garston to Southampton approaching the short Harbury Tunnel.